Energy-efficient T8/bi-pin LED light­ing tubes are the lat­est fluorescent-replacement LED light­ing prod­ucts LEDtron­ics® announces in its green-technology lineup. The series LED48T8-288-001W bi-pin LED fits into stan­dard G13 bases and is designed to directly replace con­ven­tional T8 flu­o­res­cent tubes that pro­vide gen­eral light­ing for com­mer­cial, res­i­den­tial and archi­tec­tural light­ing appli­ca­tions. The 48? long white tubes pro­vide the equiv­a­lent light out­put of 24 to 32-watt flu­o­res­cent lamps while con­sum­ing less than a max­i­mum of 19 watts. In addi­tion, the LED48T8 tubes run on a wide volt­age range of 100 to 290 volts AC. When it comes to rated life, the LEDtron­ics series LED48T8 really shines. While con­ven­tional flu­o­res­cent lamps typ­i­cally have a rated life in the range 8,000 to 24,000 hours, the LED48T8 lamps boast an oper­at­ing life of 50,000 hours and more?—?5.7 years of con­tin­u­ous light. Fur­ther­more, since the LED lights pro­duce so lit­tle wasted heat, the tem­per­a­ture inside the fix­ture does not build up as it does with con­ven­tional flu­o­res­cent tubes. 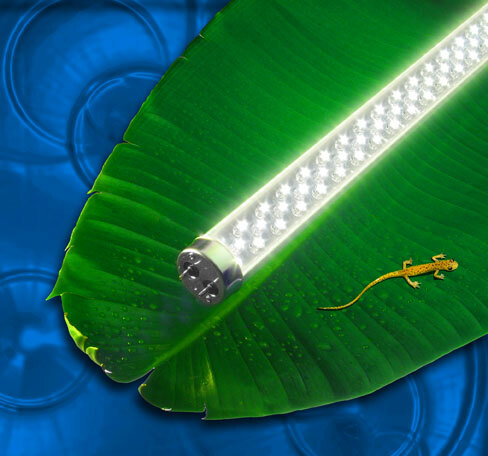 The sturdy con­struc­tion of a UV-resistant poly­car­bon­ate hous­ing over the LED tube pro­vides increased pro­tec­tion (no glass to break) and shield­ing against many envi­ron­men­tal effects, allow­ing them to be placed in loca­tions where typ­i­cal lights would be more vul­ner­a­ble to the ele­ments. In addi­tion, LEDs per­form well in tem­per­a­tures from –35C° to +45C°, mak­ing them ideal for appli­ca­tions sub­ject to fre­quent on-off cycling, such as garages and base­ments, while the alu­minum back cover helps with bet­ter heat dis­si­pa­tion and a longer life­time for the LEDs. The LEDtron­ics LED48T8 lights deliver up to 1,342 lumens at a color tem­per­a­ture of 5000K (pure day­light white) and 1,072 lumens at a color tem­per­a­ture of 3000K (warm white), com­pared to the aver­age 810 lumens for equiv­a­lent con­ven­tional flu­o­res­cent tubes. They pro­vide a bright­ness of up to 429 max­i­mum foot can­dela across a 114-degree beam pat­tern, with an impres­sive CRI of 80. Other ben­e­fits of LEDs over flu­o­res­cents include: Quick and easy instal­la­tion to min­i­mize retro­fit costs; no bal­last and starter needed, thus no radio fre­quency to inter­fere with radio and tele­vi­sion sig­nals; instant, full-strength lightup; no buzzing or flick­er­ing; and direc­tional dis­tri­b­u­tion of light?—?good for inte­rior task light­ing. Solid-state design ren­ders LEDs imper­vi­ous to shock, vibra­tion, fre­quent switch­ing and envi­ron­men­tal extremes. Sav­ings from reduced main­te­nance costs and down­time quickly return the cap­i­tal invest­ment expen­di­ture, mak­ing them as friendly to the envi­ron­ment as they are to the oper­at­ing bud­get. The pos­i­tive envi­ron­men­tal impacts of LED lights addi­tion­ally come from the con­sis­tent, reduced power con­sump­tion, long ser­vice life, high-quality light, and cold tem­per­a­ture oper­a­tion, with the cor­re­spond­ing reduc­tion in green­house gases and the reduced waste from fewer replace­ments. Unlike con­ven­tional flu­o­res­cent bulbs, LED lights are not dis­posed of as haz­ardous waste at end of life. The LEDtron­ics LED48T8 tubes com­ply with RoHS?—?the lead-free and mercury-free direc­tive, as well as the CE safety assur­ance. They emit no infrared or ultra­vi­o­let radi­a­tion, and effec­tively reduce light pol­lu­tion, being com­pat­i­ble with the inter­na­tional “dark skies” ini­tia­tive. The LED48T8-288-001W Pre­mium 4-ft (1200mm) Tube Lights come in two col­ors: Warm White (SIW) and Pure Day­light White (TPW). Other view­ing angles, tube lengths and a vari­ety of LED col­ors are avail­able for OEM cus­tomers. Large-quantity dis­counts are avail­able for qual­i­fied dis­trib­u­tors. Avail­abil­ity is stock to 6 weeks. Founded in 1983, LEDtron­ics leads where oth­ers only fol­low when it comes to design­ing, man­u­fac­tur­ing and pack­ag­ing state-of-the-art LEDs to meet the world’s con­stantly chang­ing light­ing needs. Our inven­tive prod­uct line encom­passes an array of direct incan­des­cent lamp replace­ment Based LEDs, low-cost snap-in and relam­pable Panel Mount LEDs, high inten­sity sunlight-visible Dis­crete LEDs, PCB LEDs cir­cuit board sta­tus indi­ca­tors, sur­face mount diodes SMT LEDs, full-spectrum rain­bow RGB LEDs and Infra-Red (IR) LEDs. For addi­tional infor­ma­tion on how to incor­po­rate fluorescent-replacement, energy-saving LED48T8 tubes into your archi­tec­tural light­ing designs, con­tact LEDtron­ics toll free at 1-800-579-4875, tele­phone 310-534-1505, fax at 310-534-1424, email us at webmaster@ledtronics.com or postal mail at LEDtron­ics, Inc., 23105 Kashiwa Court, Tor­rance, CA 90505.